SWedge is a quick and simple-to-use analysis tool for evaluating the geometry and stability of surface wedges in rock slopes. Commonly used together with Dips, SWedge is a key tool for the analysis of rock slope stability. SWedge is a quick, interactive and simple-to-use analysis tool for evaluating the geometry and stability of surface wedges in rock slopes. Wedges are defined by two intersecting discontinuity planes, the slope surface and an optional tension crack. SWedge provides an integrated graphical environment for fast, easy data entry and 3D model visualization. Rock bolts, shotcrete or support pressure can be applied to increase the wedge safety factor. Destabilizing forces due to water pressure, seismic loads or external forces can also be easily modeled. Joint shear strength options include Mohr-Coulomb, Barton-Bandis or Power Curve models, and a joint waviness angle can be defined. 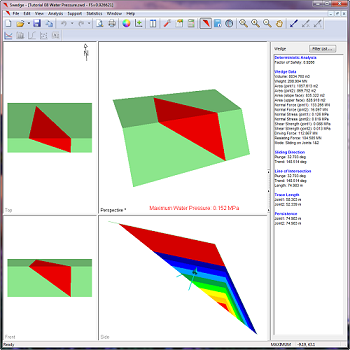 Wedges can now include a basal failure plane (pentahedral wedges). As a result, wedges can now be comprised of three joint planes. Bench analysis is now available for determining stability and optimal bench widths (open pit mining). Design standards such as Eurocode and BS8006 are now supported. Multiple units (MPa, KPa, ksf, psf, tonnes/m2, tons/ft2). With 64-bit support, large combinations and probabilistic analyses can now be performed. New and improved graphs allow for more customization. Can now filter wedges by sliding mode (sliding on joint 1, sliding on joint 2, etc.) in both probabilistic and combination analyses. Users can now define a design factor of safety for probabilistic analyses. Probability is now P (FS<design FS). Added upper hemisphere projection in stereonet view. Sensitivity for a single strength criterion on all joints has been added. Failure mode is now a statistical output to Excel files. Improved picking of wedges in scatter plot. Users can now contour water pressure on the joint planes and show the wetted area. Different support types can be combined (e.g. bolts and shotcrete), and the required support parameters necessary to achieve a given factor of safety can be readily determined. The following options are available in SWedge for applying loading to wedges to simulate destabilizing or stabilizing forces. Critical load values can easily be determined with the Sensitivity Analysis option. 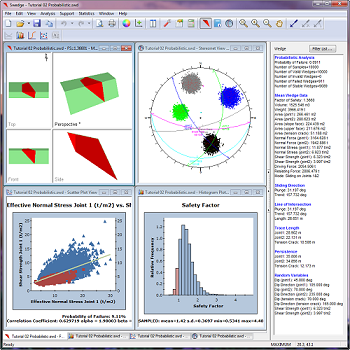 SWedge provides deep integration with Dips — a Rocscience software program designed for the graphical and statistical analysis of orientation data using stereonets. Dips and SWedge are commonly used together for the analysis of rock slope stability. 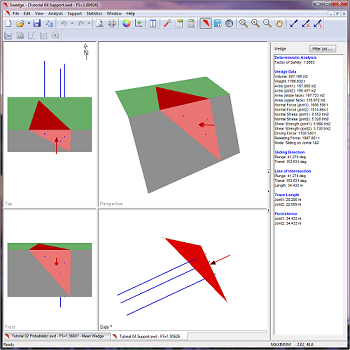 If the SWedge Analysis Type = Deterministic, you can import individual plane orientations from a Dips file and assign the orientations to the Slope, Upper Face, Joint1, Joint2, or Tension Crack. If the SWedge Analysis Type = Probabilistic, you can import mean orientations and statistical joint set information (Fisher K value or standard deviation) from a Dips file, and assign the information to Joint1, Joint2 or Tension Crack. 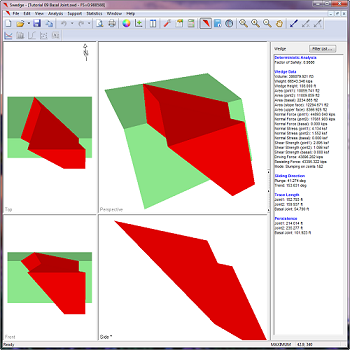 If the SWedge Analysis Type = Combinations, you can import any number of plane orientations from a Dips file, and SWedge will analyze the stability of all possible joint combinations. In a Probabilistic Analysis, you can define statistical distributions for input parameters (e.g. joint orientation, shear strength, water level), to account for uncertainty in their values. 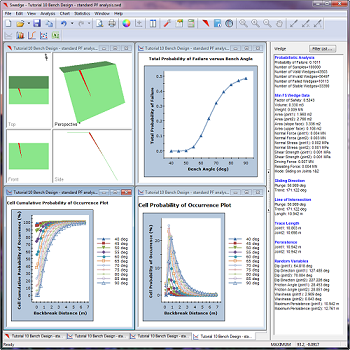 When the analysis is computed, this results in a safety factor distribution from which a Probability of Failure (PF) is calculated. The Combination Analysis option in SWedge allows you to define any number of discrete joint plane orientations, and all possible combinations of two joints which can form a wedge will be analyzed. The wedge with the minimum factor of safety is determined, and results can be plotted on histograms, scatter plots and the stereonet view. The Combination Analysis option can be selected in the Project Settings dialog or from the drop-list in the toolbar. By default, the minimum wedge Factor of Safety (FS) is displayed in the toolbar. Because the Combination Analysis option is not, strictly speaking, a Probabilistic Analysis, a Probability of Failure is not reported. If desired, a Probability of Failure can be calculated by dividing the number of failed wedges by the total number of joint combinations. The interpretation of results in this regard is the responsibility of the user.